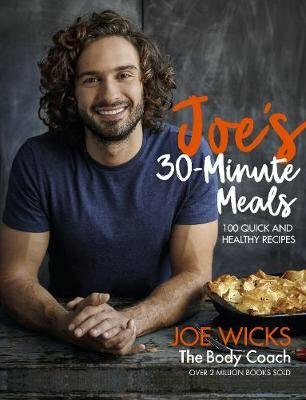 Bestselling author Joe Wicks, aka The Body Coach, presents this gorgeous book featuring more than 100 nutritious recipes that are perfect for sharing. Proving once again that you don't need loads of time to cook great food, Joe’s 30-Minute Meals is packed with everyday healthy dishes that you'll want to make, time and time again. Most chapters are simply organised by main ingredient, making it easy to find a dish for every occasion. Every recipe is labelled as either reduced-carb or carb-refuel – this makes the book a brilliant addition for those already familiar with Joe's eating structure (carbs following workouts or on active days), but the meals are also enjoyable and tasty for all, whether you are following Joe's plan or not. Whether you're looking for a crowd-pleasing lunch like the Bang Bang Chicken Stir-Fry or something tasty to chuck in the oven at the end of a long day such as Joe’s Sausage and Mushroom Pie, Joe's 30-Minute Meals makes it easy to make a fuss-free, tasty plate of food, every single day.